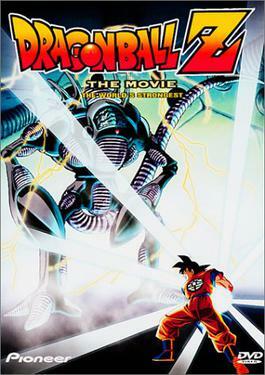 To the best of my knowledge this is the first Dragon Ball Z movie I saw. I've still got this bad boy on VHS, too. This isn't the Funimation version either, but the uncut Geneon version. That means that Sean Schemmel is not the voice of the main character Goku. Instead it's Peter Kelamis. All the other voices are different, too. Not bad, but certainly jarring for those used to the English Funimation voices. The most jarring is Dave Ward's Master Roshi. It's certainly the most difficult voice to tolerate. It just doesn't have the same ring as Mike McFarland's Roshi. The opening theme song is called CHA-LA-HEAD-CHA-LA and it is sung by Hironobu Kageyama. Think cheesy '80's Japanese pop music. So brace yourself. It's the same as the original OP for the actual series. The Funimation dub has its own OP, though. There is also another song of which I must give you warning that takes place within the actual movie. It's another Japanese hit called, I Love Mr. Piccolo. Quite cringe-inducing indeed. The plot itself is simple enough. Two mad scientists named Dr. Wheelo and Dr. Kochin want to seek out the world's strongest fighters so that they can take the body of the world's strongest fighter and use it for their own means. Now what would do they want with a strong body? Well, Dr. Wheelo had an accident (can you say giant avalanche?) and his brain is now encased in a seriously tricked out glass bowl and he wants a strong body in which he can put his brain. Then he can rule the world... with science by his side. Dr. Kochin plays the part of Renfield to Dr. Wheelo's Dracula and has to round up all the lucky candidates. For some reason they've never heard about Goku and they believe that Master Roshi is the world's strongest fighter. Yeah, go figure. Well, this is early in the movie series. It's only the second of the thirteen Dragon Ball Z movies. Most of the movies cannot fit in the Dragon Ball Z plot and this is one of those that don't fit. There's no way Goku can have that symbol on his back (pictured above) and still be alive or on earth at the time this movie is supposed to take place. So just forget about that. The movie is fun by itself. It's not the best of the DBZ movies, but it'll do in a pinch. At least it's an hour long. Most of the movies in the series are restricted to 50 or 45 minutes and that can be a downfall because it seriously restricts plot development. This one doesn't suffer from that. Just bad music. I'd give this one a 6.7 out of 10. Better than some of the early DBZ movies, but not nearly as good as some of the later ones. NOTE: In the uncut version are a few "hells" and "damns." I thought that was so cool when I was younger, but that's why they call it "uncut." Dean Koontz used to be very talented. He could create some great stories and they'd hit you right in your face and you couldn't wait for more. Now Koontz is phoning it in in books like Breathless and Your Heart Belongs to Me, but I'm sure that he's going to rediscover his talent one of these days. I've been reading Dean Koontz's Strange Highways for some time now. This short story collection is wonderful and I was he could channel the same spirit that went into this collection. The first story, the short novel "Strange Highways" is a dark time-travel story about a man with a past sent on a journey to redeem himself. "Man with a past" could make a good subtitle for this collection and most of Koontz's novels, but these stories don't seem cliched and trite as some of Koontz's novels do. 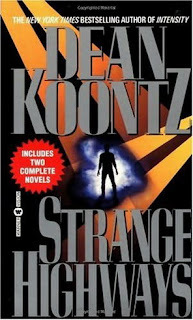 Darkness is common theme in these stories and that's what's missing from Koontz's writing these days. "Down in the Darkness" and "Twilight of the Dawn" also deal with darkness, but two different kinds of darkness. "Twilight of the Dawn" deals with a father trying to deal with tragedy after tragedy while holding on to his devout atheism and trying to keep his son from falling into the clutches of religion. This story really hit home for me. Very tough to read at times, but a wonderful story. "Down in the Darkness" deals with a man who has to deal with a thirst for vengeance while staring at a cellar door that leads to an impenetrable darkness where something hungry is waiting. "Ollie's Hands" is another favorite story of mine. It deals with a man who has a peculiar ability in his hands that he prefers to keep hidden. There isn't one bad story in this collection. All of them except for one are very serious and dark and demand attention. The one story that sticks out like a sore thumb is "Bruno." Koontz can't resist writing a goofy story or a humorless book and with "Bruno" he succeeded at resisting both. Koontz's humor can fall flat for me and this one kind of did, but the story itself was weird enough to keep me interested. It's about a gumshoe that discovers he's a portal to other dimensions (in the story they're called "probabilities") and he discovers this by catching a talking-bear cop in his room. The bear's name is Bruno. Together the gumshoe and Bruno have to catch an evil alien from causing havoc in the gumshoe's probability. Now how could I not like a story like that? All in all this is a great collection. I just wish Koontz could write like this again. At the very least another fantastic collection like this one would be a welcome sight. It makes me sad to read what Dean Koontz has gone on to do. Where is the guy that wrote these stories? I hope someone finds him soon. I give it a 9.0/10.